When time is crucial, the LEVO offers the fastest cycle times in PostProcess’ Surface Finish Design Series. Their patent-pending circular units are also ideal for running smaller parts to achieve an automated ‘customer-ready’ finish. The LEVO Surface Finish is capable of finishing surfaces of the following 3D printing technologies: FDM, SLS, SLA, CLIP, PolyJet, Multi Jet Fusion (MJF) and more. The LEVO Surface Finish system applies patent-pending technology, including optimized energy with circular motion, combined with abrasive and polishing media, to achieve your desired surface finish results. The LEVO has been designed to meet the specifications for the desired Roughness Average (Ra) to achieve various types of finishes on a wide range of 3D printed materials. The LEVO, along with PostProcess’ entire surface finishing line, has been designed with noise-reducing features for low dBa to reduce the noise in your production environment. Click to download the PDF Specifications. Whatever your surface finish requirements are, the RADOR has been engineered to meet the specifications for the desired Roughness Average (Ra) to achieve various types of finishes on a wide range of 3D printed materials. The RADOR is capable of finishing surfaces of the following 3D printing technologies: FDM, SLS, SLA, CLIP, PolyJet, Multi Jet Fusion (MJF) and more. The RADOR Surface Finish system applies patent-pending technology, including optimized energy with vertical motion combined with proprietary eco-friendly consumables to achieve the required surface finish on each of your 3D parts. The RADOR is ideal for larger parts, or with an optional divider, can run two smaller envelope sizes with different media in each allowing for the handling of abrasion and polishing. 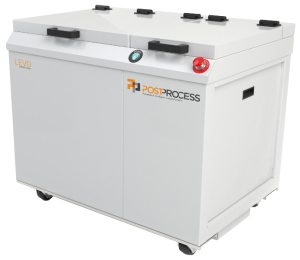 The RADOR, along with PostProcess’ entire surface finishing line, has been designed with noise-reducing features for low dBa to reduce the noise in your production environment. The patent-pending NITOR automated surface finish system is exclusively engineered for additive manufactured parts. Designed to meet the specifications for your desired Roughness Average (Ra) to achieve various types of finishes, the NITOR is ideal for all 3D printed materials, including FDM, SLS, SLA, CLIP, PolyJet, Ultem and more. No other post-print solution integrates hardware, software, and chemistry into a complete system that removes the post-print bottleneck to enable increased time to market. 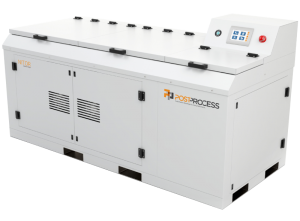 PostProcess is singularly dedicated to post-print technologies for the additive manufacturing market. The result is a forward-thinking design that increases the efficiency of your 3D printing operations. The NITOR’s large working envelope can be divided to run both abrasive and polish operations simultaneously. Additionally, PostProcess’ proprietary and eco-friendly media and detergents are formulated specifically for additive materials. PostProcess’ AUTOMAT3D™ software, which controls their proprietary Agitation Algorithms, provides real-time decision making for your desired surface finish while preserving the fine-feature detail of unique geometries. 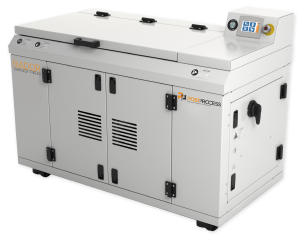 Precisely controlling all variables, including heat, frequency, amplitude, and lubricity, PostProcess solution ensures less breakage. In addition, you have the capability to “set it and forget it” with recipe programming that no other system can offer.